Hi. My name is Niki. 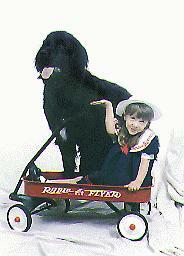 I am a Newfoundland dog, and I belong to Valerie Rosen and her Mommy and Daddy. I'm really lucky because I have a really nice "adopted" family. I also have a HUGE biological family. I have a really fun life. My daddy takes me for hikes 3 or 4 times a week. We live in the mountains, so there are a lot of really fun places to go. 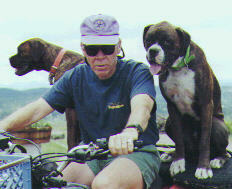 We usually go with my friend, Mugsy. My favorite hike is when we go to Camp Condor. I also really like to swim. When I was about 4 months old, my Mommy & Daddy & Valerie took me to the lake for the first time. It was so much fun to swim. It turns out that, like all Newfies, I have webbed feet, so swimming is really easy for me. Last August, my family took me to a beach in Ventura. When we got there, there were a whole bunch of Newfies practicing there swimming. Daddy told me that I can get a Water Dog title from the Newfoundland Club of America and that then I can get a Water Rescue Dog title. So I practiced for the Water test, and on October 8, I passed the test and got my Water Dog Title! Next year, I'll try to learn everything I need to get my Water Rescue Dog Title. It's really fun practicing to be a Water Rescue dog. Daddy throws a boat bumper out in the water and then I get to go out and bring it to him. Then Daddy swims out in the water with me and grabs the hair on my back and I pull him back into shore. Daddy says that eventually I be able to pull a boat into shore with 2 people in it and I'll learn how to swim out to people who are drowning and bring them a life ring. This is a picture of me jumping off a boat to rescue Daddy. I was born on May 28, 1994 to Yogi & Ginny. 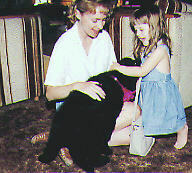 When I was about 9 weeks old, Daddy came and asked Ginny if I could come home with him because he knew that Valerie would love me (actually, I had met Valerie a couple of weeks earlier when she came to look at us puppies). Ginny approved, because she new that Valerie would be a good person for me to own. It was so exciting when Daddy brought me home. Valerie was asleep, so I played with Mommy & Daddy for awhile. When Valerie woke up, Daddy took me outside and put a bow on me. Then we came in the door and surprised Valerie. She was really happy to have a dog again, because her old dog, Oso, had to go to heaven a few months earlier. It was a really fun day. I've got a great family and a happy life. And most important, I take good care of Valerie and the rest of my family every day. Thanks for stopping by my homepage.